Y ou'll find Tres Leches Cake—"Three Milk Cake"— on the dessert menu of most restaurants in San Miguel de Allende that serve authentic local foods. This rich, drippy-moist and sweetly delicious Mexican cake is as authentic as it gets. Actually, it is popular not just in Mexico but throughout Latin America. 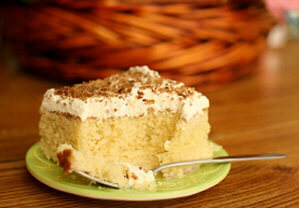 Want to make your Tres Leches Cake and other Mexican dishes and desserts even more authentic? Pastel de Tres Leches takes its name from the combination of three milks—evaporated milk, sweetened evaporated milk, and heavy cream—that are poured over the warm cake and allowed to soak in. The result is extra moist and sweet without being mushy or cloying. No one seems to know exactly where and when it was first created. some say Nicaragua, others Mexico. Or maybe it was Cuba. But mose people claim it was actually originated by the Nestle Company. Apparently, they put the recipe on the can labels for their evaporated and sweetened condensed milk products sold in Latin American countries. The cake caught on and has been a Mexican kitchen mainstay ever since. You'll find lots of variations in San Miguel de Allende and elsewhere for a Tres Leches Cake recipe. Some use a lot of butter, others have more of a sponge cake base. I like the one from El Buen Cafe, located on the corner of Jesús and Cuadrante in San Miguel. Owner Kris Rudolph is a great pastry chef. She's been baking cakes—and especially Tres Leches Cake&# at the cafe for over 17 years, and I think she gets it just right. Here is her recipe, reprinted with permission from her bilingual cookbook, Recipe Secrets from "El Buen Café." You can buy it, and other cookbooks by Kris, at her website at the link above. 8. Once you remove the cake from the oven, place the two layers onto separate large trays with a rim. Start pouring the three milks onto the hot cake, using a toothpick to prick the cake and help the milk soak in. (This step must be done while the cake is hot.) All the milk should be absorbed. Don't stop until it is.